Enes Kanter had himself a playoff game to remember. On Sunday, the Portland Trail Blazers center went out against the OKC Thunder, his former team, and dropped 20 Points, 18 Rebounds, 2 Assists, 2 Blocks, and 1 Steal on 53% shooting from the field. During that game, however, a Blazers fan in the crowd was shown waving a peculiar pro-Kanter sign that was shown on the National broadcast. It should be noted that Kanter is Muslim and his religion largely gets subjected to the “terrorist” label, especially in the country, even when it’s not particularly true. 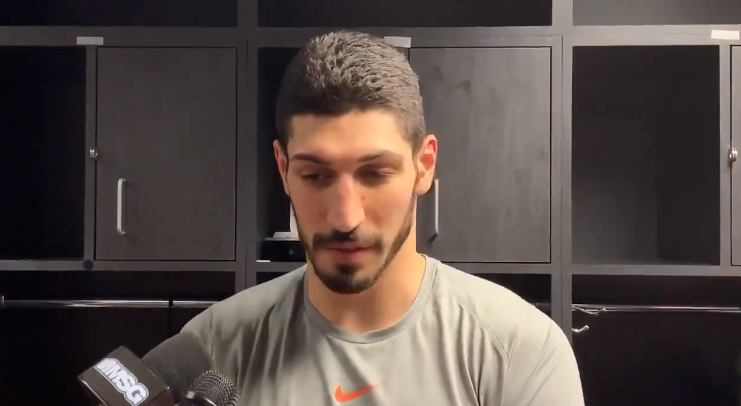 How did @trailblazers & @ModaCenter let a fan in that referred to Enes Kanter, who is a devout Muslim, as a “rim terrorist” and why was it displayed on the big screen?